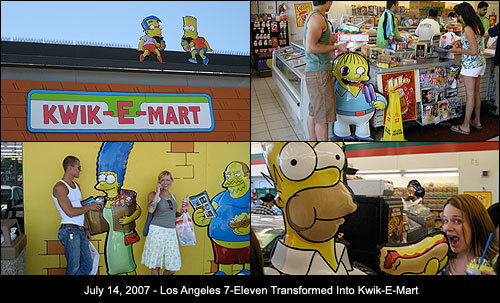 To promote The Simpsons Move which opened in theaters on July 27, 2007, select 7-Eleven stores across the country were temporarily transformed into Kwik-E-Marts - the cartoon convenience store operated by the character Apu Nahasapeemapetilon. In addition to a new look, the 7-Eleven stores carried new products -- real-life versions of products featured in the cartoon, including Buzz Cola, Squishee frozen drinks and... Frosted Krusty-O's breakfast cereal. The "Krusty" in Krusty-O's refers to Herschel Pinkus Yerucham Krustofski, better known as Krusty the Clown in the TV series. In addition to being a television entertainer on the show, Krusty is also well known for lending his celebrity name to third-rate products -- products such as the talking Krusty doll, Krusty's home pregnancy test kit, Krusty-brand pork products, Krusty-brand mustache trimmer and Krusty-brand low-income housing. Krusty-O's - the fictional cereal - was featured prominently in a season 6 episode of the Simpsons called "Round Springfield". In the episode, young Bart Simpson gets sick from the cereal because it has "jagged metal Krusty-O's inside!" 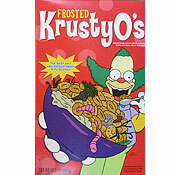 The real-life promotional Krusty-O's box shows a primarily brown cereal that contains worms, nails, screws and hair. This is deceptive. None of those things are in the actual cereal. No twigs or leaves either. 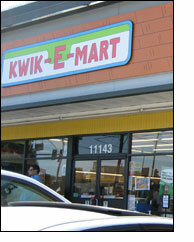 Real-life promotional Krusty-O's is nothing more that generic Froot Loops. It might taste a little more "perfume-y" than Kellogg's brand Froot Loops, but that's the grossest thing you can say about it. Is this really "The best you can expect from a TV clown" as the box states? I wonder. At the very least, the cereal could have been brown. As a real-life breakfast expert with real-life cereal in my mouth, I have to rate this cereal as I would any other. I'm deducting four points (golden eggs) because the flavor is sub-par. Now, I'm adding one point because of the fun promotional nature of the product. Finally, I'm taking the box and putting it on my shelf... and now I wait... in 20 years, I'm selling this thing on eBay for a hundred dollars... maybe millions. What do you think of Frosted Krusty-O's?